Your will is one of the most important documents you will ever make. It can have significant implications for the distribution of your assets after your death, and the tax treatment of your estate. There are endless cases in which the affairs of a deceased individual have been dealt with in an unsatisfactory manner, simply because the individual in question failed to make a will. Occasionally, however, simply making a will is not enough. It is not unheard of for a will to be challenged, especially when the estate is of a high value or family circumstances lead to a conflict between beneficiaries. As such, it is vitally important that your will stands up to legal scrutiny. 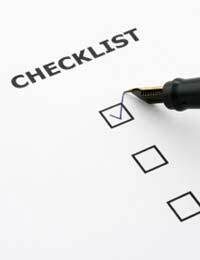 This checklist will help to ensure that your will is watertight. Many people choose to make their will themselves. This is frequently a perfectly reasonable course of action; many wills are simple enough, consisting solely of simple instructions to executors. However, in more complex cases it will be necessary to seek proper legal advice. This is particularly true if you are establishing a trust, or if your personal affairs are particularly complex. It is worth remembering, however, that some less scrupulous solicitors will name themselves as executors, and charge a fee for this service. While this may be beneficial in some circumstances, you should make sure that your chosen executor is properly named, whoever that may be. You should always check with your chosen executors before naming them in your will. Executors may be obliged to shoulder a significant burden, and you should clarify the nature of their role with them before completing the document. Furthermore, if you outlive your executors it is vital that you amend your will accordingly. Further information on these changes can be found in articles elsewhere on this site. Trusts are a very useful legal device, particularly for those who wish to shield their assets from the dreaded inheritance tax. However, it is important that the document is properly constructed in order that the trusts are valid. You should make sure that you have permission from your chosen trustees before naming them in your will or any other document establishing a trust. While seemingly unlikely, it is possible for the instructions in your will to contravene other elements of the law. This is a particular risk when you give instructions regarding the welfare of any children after your death. Stipulations of a will are not valid if they contravene other laws, and you should therefore ensure that the document is fully compliant with current legislation. Again, you may wish to seek advice from a solicitor if you are in doubt. There is no point in making a will if no-one knows where it is. Make sure that you keep copies safe; many people choose to lodge it with their solicitor. Furthermore, you should ensure that all relevant parties (particularly the executors) are aware of its existence and know where to find it. Writing a will should not be too strenuous a task unless your affairs are unusually complex. Giving consideration to these simple tips should help ensure that your will is effective, and that your dependants receive the benefits you have intended.